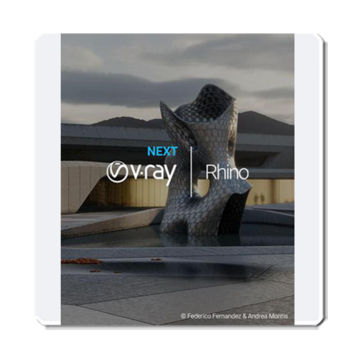 V-Ray Next for Rhino is here with brand new features to help you render faster, work smarter and supercharge your design workflow. Now you can do more in Rhino (and Grasshopper) than ever before. Rhino Workstation licenses include 1 GUI and 1 Render Node license. For more information please visit V-Ray for Rhino. Note: This product is not available for sale in South America from our virtual store. We ONLY SELL V-Ray to Central America, the Caribbean, Mexico, and the U.S.
Nota: Este producto no está disponible para venta en América del Sur desde nuestra tienda virtual. V-Ray si está a la venta para Centroamérica, el Caribe, México y los Estados Unidos.